Working capital management is the most important management activity in emerging and mid-sized companies because of the significant financial impact that it has on the company’s well-being. While most CEOs and business owners have heard and accept that “Cash is King,” working capital is often the least understood and most poorly managed area of their companies. When working capital is not adequately managed, the deterioration of cash flow critically affects a company’s ability to fund operations, reinvest in the business and, ultimately, to survive. With adequate working capital management, cash flow supports a company that thrives in the marketplace. Do you believe that the finance department is the most important department in any business? 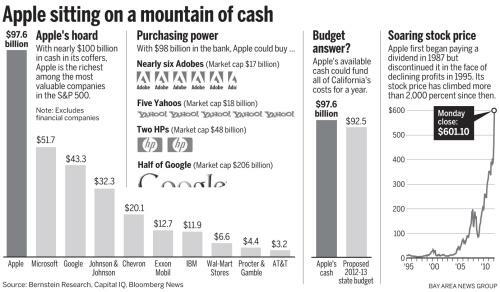 Why is Apple sitting on $142bn?